Home » How do I repair a corrupt iPod library? This article explains how to repair an iPod/iPhone library that has become corrupt. Make sure you have read the following article before you continue reading. 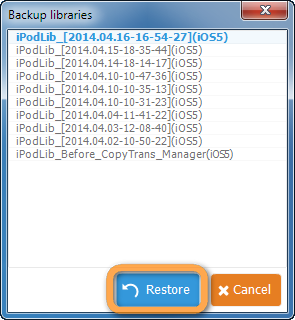 CopyTrans Manager will create a backup of the current library, and then restore the library you selected. If the above didn’t help, please read the following article: I get an error message stating that my iPod library is corrupt.